Quick Thoughts: What is the “Seven Mountains Mandate”? Lyndon Unger of Mennoknight, who also blogs for The Cripplegate, has written an excellent piece on the Seven Mountains Mandate (SMM). This is a subject we’ve reported on many times to remind people of the unbiblical nature of this so-called mandate. Still, a large number of professing evangelicals are unaware that SMM is the brainchild of the New Apostolic Reformation false teachers who like to think of themselves as modern-day “apostles” and “prophets.” Because the NAR is steeped in Eastern Mysticism it is considered a cult-like group. If you’ve heard of the New Apostolic Reformation, you’ve heard of many strange ideas. 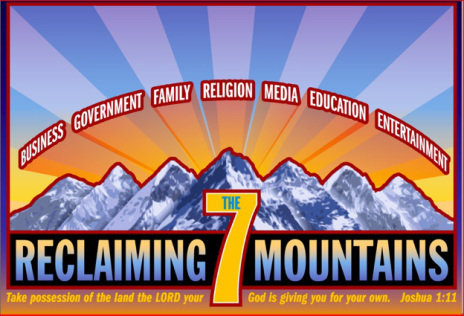 One of those may be the “Seven Mountains Mandate.” What is that exactly? Well, the Seven Mountains Mandate is an idea that originates in a vision that Loren Cunningham (founder of YWAM) and Bill Bright (founder of Campus Crusade for Christ, or Cru, and author of The Four Spiritual Laws) both had in 1975 (read about it here and here and here and here). The idea was that there are seven spheres (circles of cultural influence) that were the key to world evangelism; if a person could “reclaim” each sphere, they would establish Christianity across the globe and finish the great commission (and as a side benefit, usher in the second coming). Cunningham was told (by God, no less), that he had to infiltrate each sphere to successfully evangelize the world. What were those seven spheres? 5) Celebration (i.e. whatever culture celebrates – entertainment, sports, etc). Cunningham claims he got the term “sphere” from 2 Cor. 10:13-16, but the rest of it was from God. Cunningham then told all the young people under him to enter those “spheres” as missionaries. He then talked about how Caleb requested the “mountain” in Joshua 14:12, so the “spheres” were re-named “mountains”. Loren Cunningham then opened a university in 1978 to attempt to train people to conquer those seven mountains. YWAM alone is currently training over 25,000 people a year to take over these “mountains”.